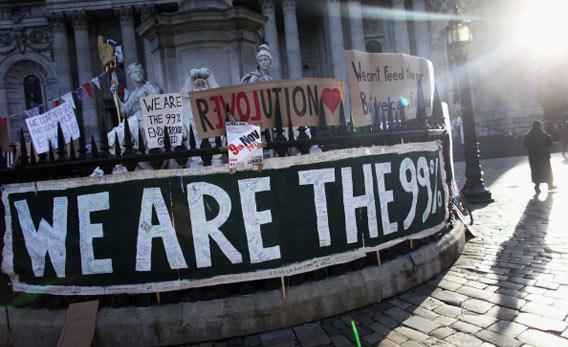 Is the global Occupy movement undermining democracy rather than strengthening it? Is the Occupy Movement Anti-Democratic? The global protests may actually undermine democracy rather than strengthen it. To my American ear, the resemblance is reinforced by the fact that the speakers are British, and thus sound as if they belong in a Monty Python movie anyway. But this isn’t unusual: Inevitably, the Occupy movements—also known in Europe as the Indignados, after Spanish protests which started last spring, have taken on different national flavors in different places. The Occupy Tokyo marchers shouted slogans about nuclear power. The Occupy Sydney protests fizzled out because, as a spokesman regretfully admitted, “we don’t have the depth of crisis here in Australia.” In Rome, where radical politics have historically had a violent fringe, marches have already turned into riots and caused millions of Euros worth of damage. Of course these international protests do have a few things in common, both with one another and with the anti-globalization movement that preceded them. They are similar in their lack of focus, in their inchoate nature, and above all in their refusal to engage with existing democratic institutions. In New York, marchers chanted, “This is what democracy looks like,” but, actually, this isn’t what democracy looks like. This is what freedom of speech looks like. Democracy looks a lot more boring. Democracy requires institutions, elections, political parties, rules, laws, a judiciary, and many unglamorous, time-consuming activities, none of which are nearly as much fun as camping out in front of St. Paul’s cathedral or chanting slogans on the Rue St. Martin in Paris. Yet in one sense, the international Occupy movement’s failure to produce sound legislative proposals is understandable: Both the sources of the global economic crisis and the solutions to it lie, by definition, outside the competence of local and national politicians. As I wrote at the time of the first Greek riots a few years ago, nobody much admires powerless leaders. Nobody much sees the point in voting for people who can’t stop another wave of economic pain rolling in from Beijing, Brussels, or New York. If one is upset about the austerity program being imposed on one’s country by indebted banks on the other side of the world, it doesn’t seem logical to complain to the mayor of Seville. The emergence of an international protest movement with no coherent program is therefore not an accident: It reflects a deeper crisis, one with no obvious solution. Democracy is based on the rule of law. Democracy only works within distinct borders and among people who feel themselves to be part of the same nation. A “global community” cannot be a national democracy. And a national democracy cannot command the allegiance of a billion-dollar global hedge fund, with its headquarters in a tax haven and its employees scattered around the world. Unlike the Egyptians in Tahrir Square, to whom both the London and New York protesters openly (and ridiculously) compare themselves, we have democratic institutions in the Western world. They are designed to reflect, at least crudely, the desire for political change within a given nation. But they cannot cope with the desire for global political change, nor can they control things that happen outside their own borders. Although I still believe in the economic and spiritual benefits of globalization—along with open borders, freedom of movement and free trade—globalization has clearly begun to undermine the legitimacy of Western democracies. “Global” activists, if they are not careful, will accelerate that decline. Protesters in London shout that “we need to have a process!” Well, they already have a process: It’s called the British political system. And if they don’t figure out how to use it, they’ll simply weaken it further.